As a coder you should never compromise on the quality of your tools and keyboard is one such important programming tool. Being a programmer you spend most of the time typing on the keyboard. Therefore, it only makes sense that you invest in the best mechanical keyboard for programming in 2018. A reliable high quality mechanical keyboard will provide you with comfortable typing experience and enhance your productivity. These mechanical keyboards use mechanical switches to give tactile feedback and help you type faster and efficiently than the standard keyboards. It is not an easy job to find the perfect keyboard to suit your need, so we put together the ultimate guide to help you in choosing the best coding keyboard. Filco Ninja Majestouch-2 is the best mechanical keyboard for programmers on the market right now. It is one of the modern keyboards that support Full USB N-Key Rollover, meaning there is no limit to how many keys you press at once, all keystrokes will be accurately registered. This feature is very useful not only for gamers, but also for programmers, as they often use extensive combinations of shortcuts while coding. Filco Ninja Majestouch 2 features front printing key caps that looks almost blank and good. This avoids the problem of fading labels. Although coders are precision typists, having faded label on keyboard do not look good. The sturdy chassis and smooth key caps call for excellent build quality. The keyboard is available with Cherry MX Brown and Blue switches and Full size or Tenkeyless option. I like the full-size but if you want to bring it on your trip then TKN is a good choice. It just weighs only 2.2 pounds and requires little space. The mechanical keyboard comes with 1.5 m cord to power up. Not all keys are backlit, but only the Caps, Num and Scroll Lock keys. See, it's not like you need an illuminated keyboard for programming work. In short Filco Ninja Majestouch 2 is the best professional keyboard that a programmer can ask for. CODE comes with a clean design with no logo on front. It's not just another programming keyboard, but the finest any professionals can get. At first glance, the keyboard may seem simple but, it balances greatly with its performance. Everything about this speaks of quality right from the build to the tactile performance. Illuminated keyboards are a great help when you are accustomed to working at late night. And CODE comes with LED back lighting with 7 levels of adjustment. It uses Cherry MX switches. The key caps have high quality labels and feel smooth at your fingertips. WASD CODE comes in several options, Tenkey-less / Full Size, Cherry MX Blue / Brown switches. The keyboard supports excellent cable routing. It has a 1.8m micro-USB cable with a cable tie, which allows you to route the cable in different ways. It is compatible with PC and Mac and offers hardware-level control. With the help of DIP switch you can turn ON/OFF the operating system keys and switch over the keyboard function from QWERTY to MAC mode. The CODE Keyboard offers great feel and supports alternate layouts - a great choice for programmers. CM Storm QuickFire Rapid is the best budget mechanical keyboard featuring Cherry MX switches and solid build. Coming from a well-known manufacturer of keyboards, QuickFire Rapid is one of the most popular products in its class. It is available both as TKL and Full Size version and completely customizable to your liking. The design is simple and clean with excellent performance. It offers several options for switches such as Cherry MX Brown / Blue / Green / Red. Cherry MX keys provide solid feedback and suitable for programmers who prefer precision and comfort. CM Storm QuickFire Rapid supports NKRO with PS/2 and 6 KRO via USB. In addition, the laser marked key caps are very durable and can be changed if desired. You also get some additional key caps and a key cap puller as well with the device. It has multimedia controls and features a detachable braided USB cord with cable routing. So you can route the cable left, right or back according to your choice. Programmers who also like to play game get a nice option with this - which is to disable Windows keys with a dedicated switch. In general it is a very good mechanical keyboard for beginners. If you are new to mechanical keyboards and want to try your hands on it, I would recommend QuickFire Rapid rather than going for expensive ones. The flagship Corsair k95 is one of the best value for money mechanical keyboard for programming. It got loads of customizing options and features Cherry MX Red and Brown switches with smooth actuation and flawless accuracy. Built with aircraft-grade aluminium, quality and durability is not something you have to worry about. 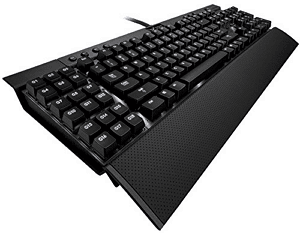 Corsair k95 is the full-size keyboard that includes number pad with 18 additional programmable G-Keys. The programmable keys support 3 different profiles offering totally 54 programmable keys. This much level of customization makes it the best keyboard for programmers. It offers many high-end features, such as Key-by-Key backlight, media control, 100% anti-ghosting and an astonishing 122-key rollover. This practically means that you can sleep over the keyboard and it would still register each keystroke separately. The fact that it requires two USB ports to power on and the lack of USB hub are the downside of this awesome keyboard. But overall the positive aspects of Corsair K95 outweigh the small negatives and it is a great professional mechanical keyboard. If you are looking for a best tenkeyless mechanical keyboard then Corsair Vengeance K65 should be your top choice. The keyboard is quite affordable and comes with rugged, anodized aluminum solid chassis. Being 10-key less keyboard, it is small and portable and can be carried with you on travel. People with large hands may find typing on tenkeyless keyboard inconvenient as the keys will be little confined. But that is not the case with Corsair Vengeance K65. Despite being compact, it has standard size keys, making typing very comfortable. It uses linear MX Red switches with acute precision and features Full Key Roll over and Anti-Ghosting. It also offers detachable USB with cable routing which is very convenient if you move around a lot. A small drawback of Vengeance K65 is the lack of programmable keys, but it is understandable because of the smaller size of the device. Apart from that, it is a great tenkeyless keyboard to program that offers comfort, accuracy and portability. 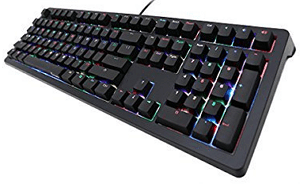 As it name suggests Ducky Shine 5 RGB is a full-size backlit RGB illuminated mechanical keyboard. The keyboard is all shiny with impressive design. It has a solid, if slightly rough chassis with individual LED backlit keys and smooth key caps. The key caps are made of double shot ABS, which is thicker and more durable than normal ABS. Generally, illuminated keyboards use special software to change colors and lighting effects. But not Ducky Shine 5. It uses key combinations to change lighting profiles, such as Breathing, Reactive, Aurora, Wave and Ripple mode. There is also the option to change the lighting level for the Red, Green and Blue colors individually. The keyboard features Cherry MX Brown / Blue switches and uses the ARM M3 MCU, to provide the fastest key response possible. It has 24 media keys, but they are disabled by default. You have to follow the instructions provided in the manual to enable them. Ducky Shine 5 comes with removable 5-foot long mini-USB cable to power on. And the good thing is it is compatible with Mac as well. You have to use the DPI switches to make it work with Mac OS. How to Choose the Best Keyboard for Programming? The keyboard is the most important gear of a programmer so it only makes sense to get a well designed quality keyboard that will last for years to come. Undoubtedly, a good keyboard will provide the best experience for a programmer and increase performance. But a poor design keyboard will make things hard and frustrating for a coder and will reduce their quality of performance. Most programmers, including myself prefer that their keyboard is as simple as possible following the standard layout and excellent response on key press. But not all programmers' needs are the same. It may vary according to their nature of work and personal preferences. Even before purchasing a new keyboard, make a list of all the features you want the most and make that priority. When it comes to keyboard its size matters. The size of the keyboard depends on the number of keys it contains. There are three common keyboard sizes available on the market and they are Full size, Tenkeyless (TKL) and Compact. A full sized keyboard follows a standard design with 104 keys, including the number pad and all. This is the size of the keyboard widely used, but they are not light and take up more desk space. Also, your hands must travel a long distance to reach the mouse. On the other hand, a Tenkeyless keyboard is lighter than the full-size keyboard and very portable. It has a standard key layout without the numeric keys, resulting in only 87 keys. This makes the keyboard smaller and also keeps the mouse closer together so you don't have to reach that far. Basically, number pad is of little use to programmers. Also, given the ergonomic factor, TKL design is probably the best keyboard for a programmer in my opinion. The third, Compact size follows a 60% design and excludes numeric keys and function keys, such as F1 to F12, Home, Insert, Delete, Page Up and Down keys. There is no doubt that the compact keyboard is the lightest of all, but at the cost of so many functional keys, it probably is not the best choice for coding work. Ergonomic keyboards usually come with sculpted or split designs that are way different from what you are used to. It will take some time getting used to the new layout and everything. But once you start working on the ergonomic keyboard, it will be difficult to return to the normal keyboard. Unless you suffer from wrist pain or injury, there's no need to buy ergonomic keyboard. For one thing, they aren't cheap and will not make you type faster. But mainly because they don't use mechanical switches in ergonomic keyboards, so feedback of keys are not that good. May be this is my opinion, but I have tried different keyboards and nothing is satisfactory like working on a mechanical keyboard. As a programmer you'll need to type fast and want a satisfactory typing experience, which is why mechanical keyboards are the best in this context. Using the wrist rest is a simple solution to maintain the ergonomics of the keyboard. It'll keep your palms raised as you type to remove strain on your wrists. In this way you can improve ergonomics of your standard keyboard without switching over to an expensive ergonomic design. The wrist rests made of rubber or finished wood are the best and come in different shapes and sizes. When buying wrist rests, make sure their height and length match your keyboard model and fit comfortably at the bottom of it. What makes a keyboard good or bad? It all starts with the type of switch they use. There are several switch technologies used in the manufacture of keyboard, such as membrane, mechanical, dome, scissor switch, etc. In these, membrane and mechanical switches are most commonly used on PC keyboards. Generally, Membrane keyboards are cheap, but their key feedback is not so good. While mechanical keyboards are designed with a separate switch under each key and is composed of a base, a spring and a rod. Based on the shape of the spring and stem used, the switches are classified into several types. And each type also has different drive force, travel distance and sound. Cherry MX and Topre are popular types in mechanical switches. If you want the best keyboard for programming, all you need to do is choose a keyboard with Cherry MX switches. Cherry MX switches come in various colors named Cherry MX Red, Blue, Brown, Black and Clear. Black and Red ones are the most popular switches for gaming keyboards. In my experience, the best mechanical switches for programming are the Cherry MX Brown, Blue and Clear switches. The tactile feedback offered by these switches gives you a great feel for every keystroke and let you into the flow of effortless coding. 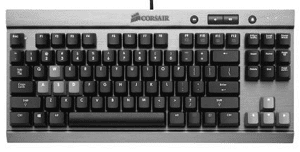 Both the Brown and Clear switches are non-clicky, so they will not make noise while typing. Also the brown switches has 45g actuation force, which is much lower, so you won't feel soreness on your fingers even after typing for long hours. On the other hand, the blue switches have the actuation force of 50g and are clicky. Therefore, they will be suitable for individuals who like to hear audible audio feedback of key strokes and it gives a great feeling of satisfaction when typing. The term Key Rollover or KRO refers to the ability to register multiple key presses at the same time on a keyboard. If a keyboard is labeled "6 Key Roll Over", it means that the keyboard can only register six keys at the same time. When labeled as "N-key rollover" there is no limitation on the number of keys you press at a time and all key presses will be recorded and carried out without fail. This feature benefits mainly in games than in programming. But programmers also get some benefits because of the extensive shortcut key-combinations they often use. The old PS/2 cable supports N-KRO by default, but the recent USB connection allows only 6 KRO. Nowadays, modern keyboards use two USB ports simultaneously and allow N-Key Rollover. Finding the best keyboard for programming can be daunting when you do not know what to look for on a keyboard. We hope this guide has shed some light on what to look for in a mechanical keyboard and given you some good recommendations in the market. Now is the time to make the choice that fits both your needs and your budget.